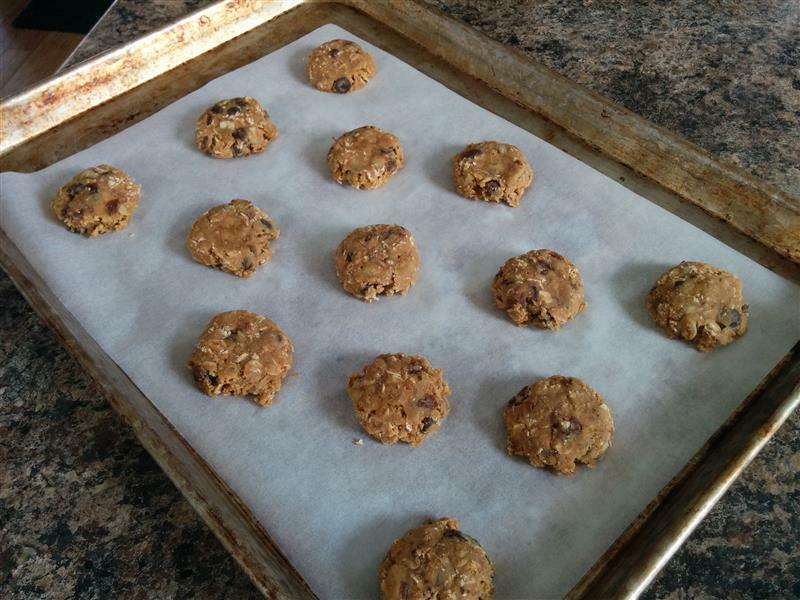 This weekend’s assignment, from The Baking Bible bake-through, is oatmeal cookies. But these aren’t just any oatmeal cookies. They’re Rose Levy Beranbaum’s take on oatmeal cookies, so you know they’re not going to be just like the ones Grandma made, because what would the point of that be? You’ve already got Grandma’s recipe, or the Joy of Cooking recipe, or the one from the Fannie Farmer cookbook, or the one from some well-aged newspaper clipping. Nope, these are going to be a little different, and you pretty much have to expect that. It’s like Rose says at the top of her chocolate chip cookie recipe in this book – many people asked for her perfect chocolate chip cookie recipe, and her response was always, “How could I improve on a classic?” I think it really boils down to not being afraid to challenge peoples’ expectations. I think a lot of my fellow bakers played with this recipe somewhat, but I always like to try things exactly as written, before tweaking, so that’s exactly what I did. First, I made the granola a few weeks ago, because I noticed that this was coming up, and I was running low on my standard go-to (Apple Cranberry), from a local company – Nature’s Mix. I like this one. I don’t remember all of the ingredients, but it’s got maple syrup, brown sugar, rolled oats, and walnuts, for sure. It’s got just a hint of saltiness, with good maple flavour, and a tiny bit of cinnamon. It’s not quite as crunchy as I’m used to, but I’m sure I could tweak that in the future. 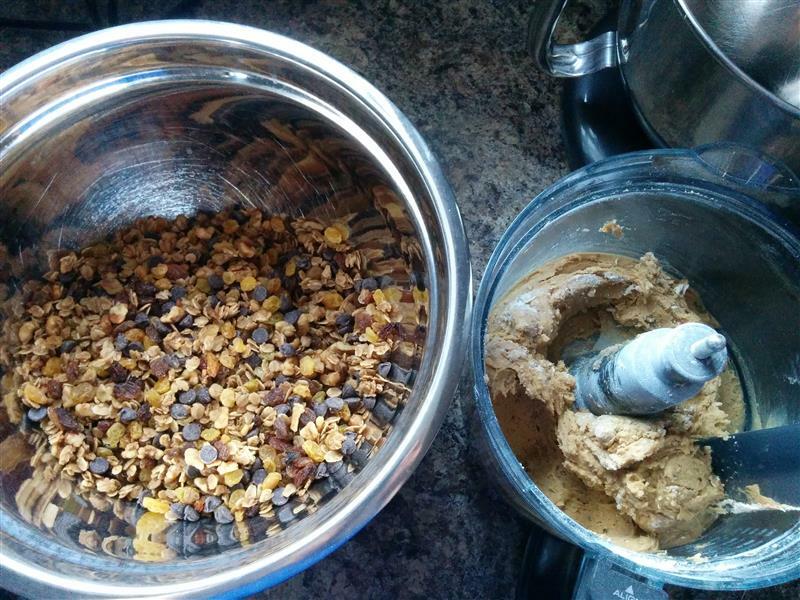 Next, mix chocolate chips and raisins into the granola. Then prep your dry ingredients, and your egg+vanilla. Whiz the sugar in the food processor, then add the butter. Add the egg mixture, and mix again, then add the flour mixture. 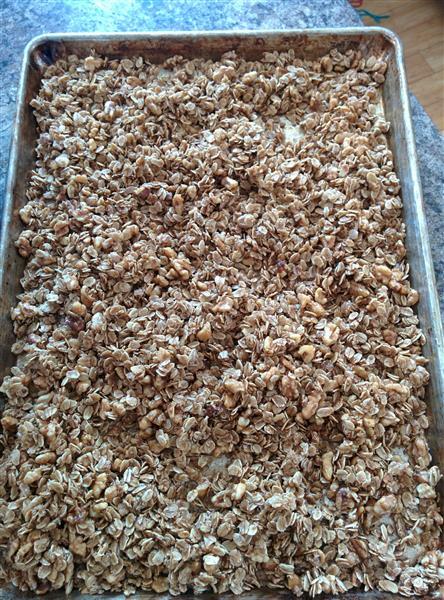 The dough’s done, now mix it into the granola. Here’s where my new food processor blew my mind again. I pulled out the hard plastic spatula that traditionally accompanies a food processor. You know the one. It’s generally crappy, and built with the sole purpose of standing up to the blades when you try to scoop stuff out. I was cleaning off the bottom of the blade with the spatula that came with my new Breville Sous Chef, and went to try to get a bit of the gunk out of the bottom of the blade, and… *brain explodes* …they either designed it to fit perfectly into the bottom of the blade, or that’s one heck of a sizing coincidence. Someone’s actually thinking about these things, at Breville! I mean, the hole on the base of this blade has no other reason to be the size it is, because the actual spot the cog that does the turning rests on is much farther up and much smaller. As someone who’s responsible for crafting requirements and helping with many aspects of user experience design, I so very much appreciate little details like this. I think Breville’s just made a new lifelong customer. Ok, back to the cookies. 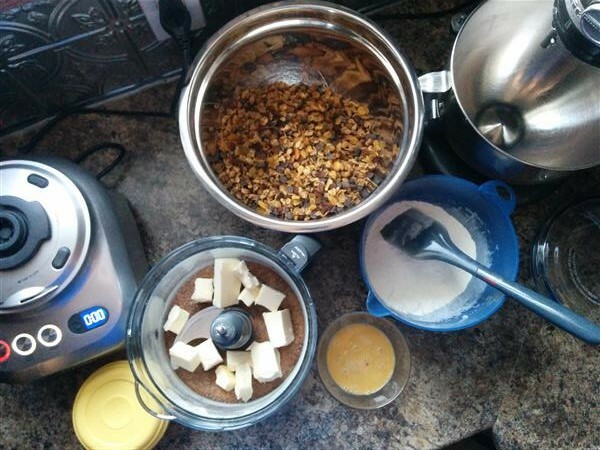 Put the butter/sugar/flour mixture into the bowl with the granola, mix it up, then stash the whole thing in the fridge. Recipe says 30 minute minimum, but I went for overnight. I was judging at the Waterloo Regional FIRST robotics competition on Friday and Saturday, so I mixed the dough up when I got home on Saturday evening, then baked them off Sunday afternoon, after going out to lunch with friends. Well, current and former co-workers. But friends, too. I sometimes can’t decide whether it’s lame that nearly all of my friends are people I work with (or have worked with), or just awesome that I get to work with so many friends. Also, I was informed this weekend by someone with teenaged kids that using the word “awesome” is a sure sign of being old. The cookies were supposed to be 42 grams each, and while I’m enough of a Douglas Adams fan to be tempted to aim for that number, I weighed one of the results of my bigger cookie scoop, and it was about 30g, and I said “close enough.” I did not roll the cookies into balls before flattening them. I figured they were round enough right out of the cookie scoop. Bake 6 minutes, rotate the pan, and bake 6 more. Even though mine were about 30% on the small side, they seemed to want about the same amount of time in the oven as the recipe called for. I thought these were fantastic, and I hope Gilad feels the same way, when I drop half of the batch off, tomorrow morning. 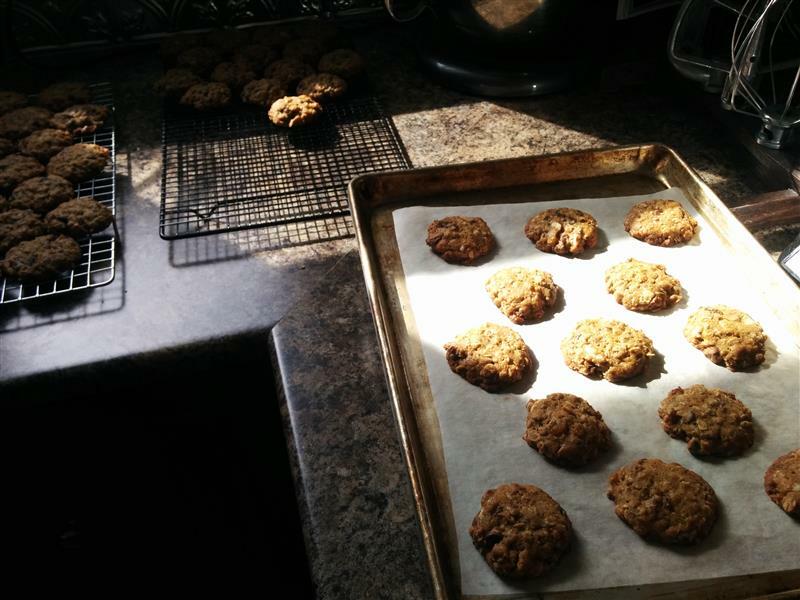 As I said earlier, these aren’t your grandma’s oatmeal-cinnamon-raisin cookies. 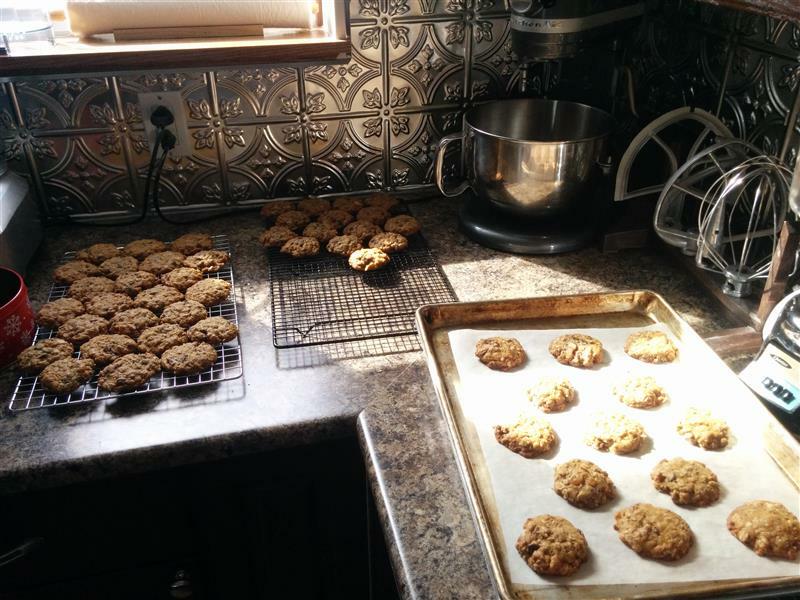 They’re Rose’s luxury oatmeal cookies… with maple, and walnuts, and raisins, and chocolate chips, and just a hint of cinnamon and brown sugar goodness. I like them a lot, and I don’t think I’d tweak much of anything, personally. I’ll be keeping the maple walnut granola on hand, as well. The one thing I may do differently there is to try to bake it just a little longer, to get some extra crunch. 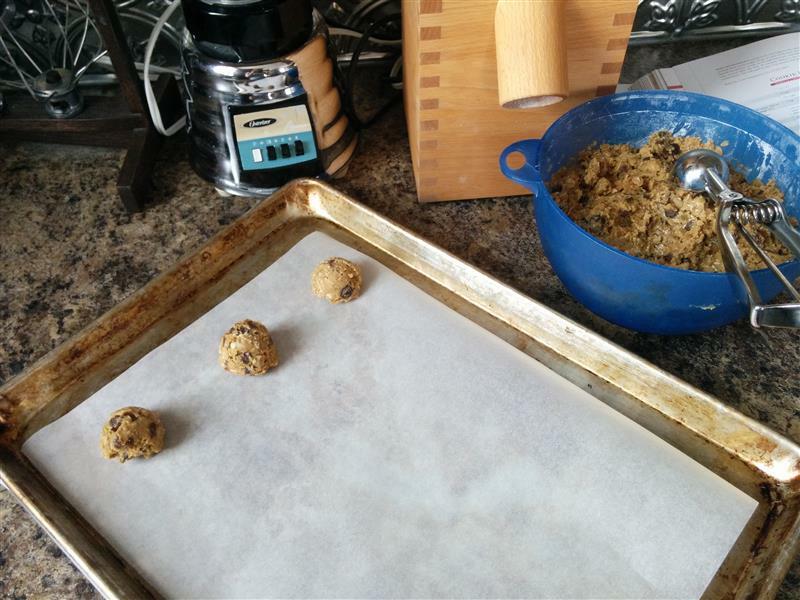 Posted on March 22, 2015 by KristinaPosted in The Baking BibleTagged cookie, granola, oatmeal, raisin. Mine got soft also in 2 days..even though I baked them to crisp..
Looks like your’s are the win this go around! They didn’t spread, were nice texture and you followed the recipe. It’s a mystery that intrigues me. I like your idea of the cookie scoop and not rolling them. Jay’s comment is hilarious! I think working with friends is the best way to work. It can help with some of the more tedious aspects of work. I considered using my cookie scoop which would have made them the same size as yours but then got curious as to how big a 42g fancy oatmeal cookie would look. Next time I’ll use the scoop and skip the rolling. They turned out AWESOME! I have the Sous Chef too and had no idea that the spatula could clean out the hole on the blade.